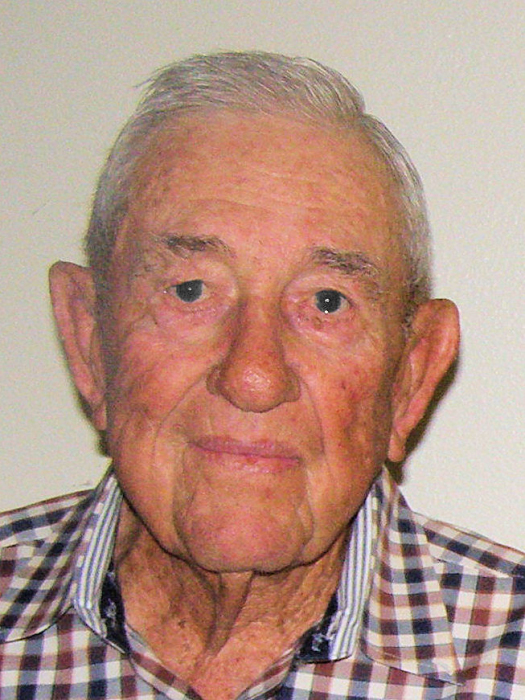 James Allen “Heavy” Hafner, age 93, of Leaday, passed from this life Tuesday, August 28, 2018, in the Coleman County Medical Center surrounded by his loved ones. Graveside funeral service will be held 10:00 a.m. Friday, August 31, 2018, at the Hill Cemetery, Coleman County, Texas, under the direction of Stevens Funeral Home. He was born James Allen Hafner on October 10, 1924, in Tuscola, the only child of Raymond Allen “Tony” Hafner and Verlie Hafner. Known affectionately as “Heavy”, he grew up in San Angelo where he attended school. As a young man, Heavy moved to Leaday with his parents and continued to live in southern Coleman County for most of his life. Heavy served in the United States Army during World War II and received an Honorable Discharge in 1946. On March 20, 1947 he married Martha Jamison in Leaday and they celebrated 52 years of marriage. He served as the Postmaster at Gouldbusk for 27 years and was a farmer and rancher. After his retirement as Postmaster, Heavy and his son Jimmy owned and operated Sportsman’s Lodge at O.H. Ivie Reservoir for several years. He spent his leisure time at his lake house fishing and also loved to take fishing trips and gambling trips to casinos. Heavy was especially proud of his new great-grandson and namesake, George Allen Rae, born this June. Survivors include granddaughter, Julia Hafner Rae and husband Max “Fuzz” of Gouldbusk, step-grandchildren Amber Bouldin and husband Monty of Fisk, Cody Slate and wife Candace of Sterling City, Haley Cook and husband Boone of Early, Travis Slate and wife Brandi of Coleman; great grandson, George Allen Rae; step-great-grandchildren, Jordan Rae, Paisley Rae and Brynley Rae; cousin, Mary Davis and husband Robert of Winters; numerous nieces and nephews. He was preceded in death by his wife Martha on March 25, 1999 and his son, Jimmy Allen Hafner on September 12, 2000. Visitation will be held on Thursday, August 30, from 5:00 p.m. until 7:00 p.m. at Stevens Funeral Home, 400 W. Pecan Street, Coleman, Texas 76834. Memorials may be made to the Hill Cemetery Association, c/o Bettie Scarborough, 800 CR 252, Gouldbusk, Texas 76845 or the donor’s favorite charity.